Monya Avis Kuns, 79, of Sherwood, passed away on Wednesday, February 21st, 2018. She was born February 16th, 1939 in Christchurch, New Zealand to Benjamin and Vera Bennett. 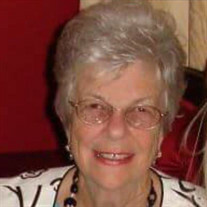 Monya was a retired administrator of a Montessori school where she was proud to have served children for over 35 years. She also had a tender heart for animals, and never passed up an opportunity to help in any way she could. Survivors are her children Jason (Jennifer) Kuns; Courtney (Mark) Littlejohn; grandchildren Grayson Littlejohn, Huntley Littlejohn; beloved pet "Logan" and other relatives and friends. Monya was preceded in death by her her parents and husband of 47 years, Henry H. Kuns, Jr.
She was a loving wife, mother, grandmother and friend, who will be greatly missed. A visitation will be held at 6:00 p.m., Wednesday, March 21, 2018 at Smith Sherwood Funeral Home.